When you introduce a Burmese to your life, your life takes on a new dimension. 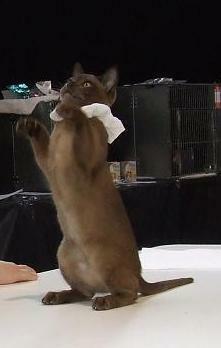 May your life be enriched forever with a love affair with a Burmese cat. Ahnyo Kyaung - House of Burmese is a small cattery in the inner city suburb of Sydney owned and operated by Karen Lease, an judge with Australia National Cats Inc. and a close association with many of the world cat fanciers. The cats of Ahnyo Kyaung - House of Burmese are lovingly raised in the house and are regarded more as children than pets. Burmese are intelligent, adventurous, and love to play. Life is one big game for them and they bring their enjoyment of life into yours. Burmese love people and have to be involved in every aspect of your life from reading the paper, gardening and even doing the dishes. Many Burmese love water and will join you in your shower or bath and even the swimming pool. They are totally convinced they are human and that you are their very best friend. They have no fear and believe that they can stop traffic with one small paw so it is advisable to keep them indoor with you if you live in the city. They love company and the only thing better than one Burmese in your life is two Burmese. They are not double the trouble just double the fun. Life is one big game for Burmese and you are not only their best friend but playmate as well. They have a wonderful sense of family and will stay with you when you are sick and will be delighted if you decide on another pet as if to say "The more the merrier and we have love to share!. "You will become firm friends with your neighbours that you did not know you had when you own a Burmese. Burmese know that everyone love them and set out to convert even the most harden cat hater to a lover of Burmese. Many people who are dog lovers, begin a relationship with a Burmese for they have a great love of fun and games and often mimic many dog-like traits like fetching toys or walking on a lead.